I'm pretty good at getting carried away. When I was younger, it got me into a lot of trouble, but I sure had a lot of fun. Over the years, I'm figuring out how to ride that drift to a positive endpoint. 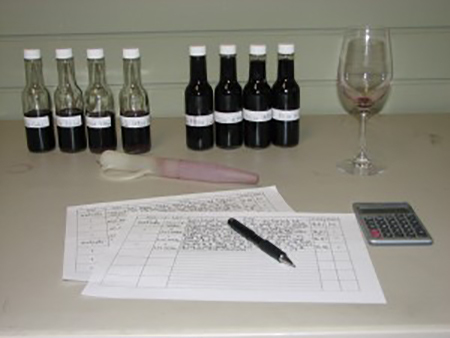 During blending trials, my favorite place to be is in the dark - that is, with my eyes closed and both my thoughts and the wine swirling in my head. It's the most imaginative place to be and the best place for me to find both the good and bad in a given wine. Blending is one of the more magical aspects of making wine. It is one of the moments in the winemaking process that you can let your thoughts soar and experience the wine on a truly hedonistic level. For a brief time, you can see the wine as brilliant portrait in your mind's eye or listen to it as a symphony in your mind's ear. You can feel the wine as a silken flower on the fingertips of your imagination and dance with it on the winged heels of your dreams. If the canvas is a bit frayed, the orchestra is a little out of tune, or the flower slightly wilted, this inner sanctum is usually where the answer can be found. I don't allow myself to go off the edge, though. When tasting, I like to drift as far as I can, but still be able to find my way back. For me, it's important to keep lots of tasting notes, so you need to be able to translate these visceral and ethereal thoughts into language that will make sense, at least to your self, if not others. Tasting notes for me are like a anchored tether tied around my waist as I venture deep into a dark cave. A few of the wines that we pulled for tasting and analysis today are destined for our Domaine Montreaux sparkling wine program. In 2008, we crushed small amounts of Chardonnay and Pinot Noir to be used for bubbly. We're considering doing a rose this year. Our sister Carolyn is no doubt already getting her popcorn maker dusted off as she hears that good news! Making sparkling wines can be a little tricky. Beginning the secondary 'methode champenoise' fermentation in the bottle is one of the more helpless feelings I've had as a winemaker. With still wine fermentations, you can sniff and taste, and plunge your hands into the juice and, for lack of a better term, really get intimate with your fermentations. With secondary sparkler ferments, it's different. Once the re-fermenting wine is bottled and the crown cap gets secured, you're on the outside looking in. The bottles are stacked away neatly in the old wooden bins that Uncle Brian built in the late 1900s, and you dust them off and crack one open every so often to see how they're coming along. The fermentations usually go along just fine, but it's a winemaker's responsibility to avoid issues, not just identify them, so we're always trying to remain vigilante with our sparkling wines (like a mix of Charles Bronson and Don Ho). Sorry, I take that back, I meant 'vigilant'. Sparkling wines are fun for everyone. 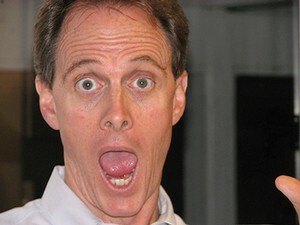 In the picture to the right, Brother Kevin reacts to a taste of young brut. Young sparklers can be fun to drink, with their apply, pear bright fruit aromas and flavors and crisp, refreshing acidity. Older sparkling wines can be a real treat as well. We've recently opened up some of our Domaine Montreaux from 1983, which was an amazing bottling of wine. Most people don't think of sparkling wines in terms of aging, but well made bubblies have all the right components for aging well - high acid, low alcohol, low pH, CO2, and pressure in the bottle to keep air from getting in and oxidizing the wine. That being said, they've got to have great fruit in the first place if they're going to go the distance. This year, we'll make just a small amount of Domaine Montreaux, and we'll likely start preparing the secondary fermentation in the next couple of weeks. I'm looking forward to bursting some bubbles !